I’ve been jumping back and forth from character creation, inventory, arranging combat, lore a small project on the side (to relax) and… Well all sorts of real life stuff that need be attended to. Updates are quite slow but I do have quite a bit I can show. But do keep in mind nothing you’ll see here is in its entirely finished state. You’ll find some incoherences, misalignments and even some things missing entirely. Still, the following should give you a fair idea where things are going. 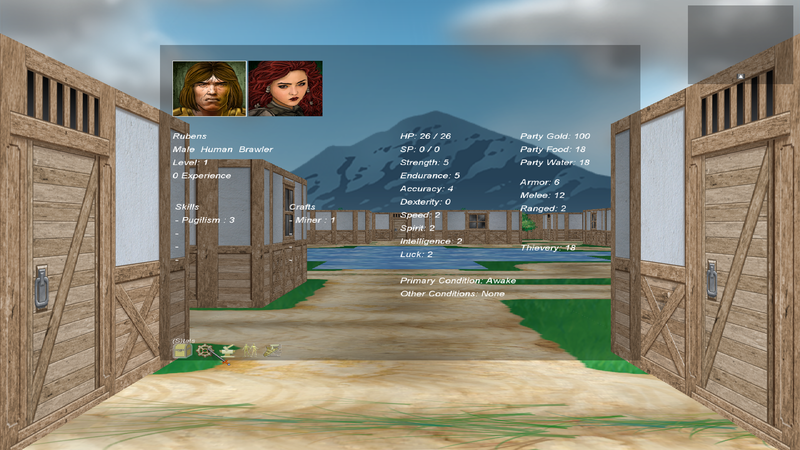 The character creation screen above shows one of several steps involved in creating a character: choosing the character portrait. The first few steps involve choosing a class, a race and a gender. these three are listed at the top left. The chosen portrait will be there as well as the character’s name. With these choices made, you get to distribute five aptitude points. These can either go in attributes, resistances, skills or craft. The first decision you will be confronted to is whether to concentrate on attributes or whether to include skills or crafts for a better rounded character. – Hovering over a choice makes a description appear, which includes (or will include) requirements. – Some skills require other skills and cannot exceed their value. Swords, for example, require proficiency in pugilism. If your character has a score of 3 in pugilism, sword proficiency cannot exceed 3. Other skills require and cannot exceed one or several attributes. Pugilism cannot exceed strength, accuracy and dexterity divided by three and rounded down. – The same goes for crafts (they can have either attribute or skill requirements, or both). Crafts are optional and choosing to learn or improve one instead of adding that point to an attribute or skill typically makes a less proficient combattant. But it is a big world awaiting you and not everything will be about winning battles. – Skills marked with an @ are active skills. These add options in battle whereas passive skills unlock other things. Two Handed for example is a passive skill that allows the character to wield two handed weapons, given he/she has the skill to wield the one-handed variety. Even if the two-handed score is higher than the weapon skill that corresponds to the weapon the character has equipped, the score that will be taken into consideration will be the lowest of the two. @Stealth, on the other hand, is an active skill that gives the character the ability to “become unseen”, which in turn allows the use of other skills. While rogues start with good knowledge of Stealth and associated manoeuvers (without need to spend aptitude points), any character can learn to do the same if you choose to have them do so. There will, however be a limit to the number of skills and crafts a charactercan learn. Character inventory is divided into three important parts. The first column on the left is the list of equip slots. Each one corresponds to a specific part of the body. (I) and (J) are respectively the right and left hand. – When you hover over an item, wherever it is, the corresponding slot in the equip list turns blue. Likewise, the corresponding part of the paper doll on the right turns blue. There will also be a definition of the item at the bottom right part of the screen (not implemented yet) and a list of comparisons on the bottom left. The screenshot shows that when you have a short sword equipped and you hover over a walking stick, choosing to swap these items will result in a gain of -6 damage (shown in red when negative, white otherwise). There will be other comparisons but as of now damage is the only one implemented. – The second list in the middle is the character’s backpack. All slots there can be used by any item. – The third part is the character inventory. It is itself made up of a list of 8-26 slots (depending on the type of container) and 5 container slots. When one of the slots is used by an available container a small chest replaces the empty white square. In the screenshot above, the highlighted container slot is a simple cloth bag with only 8 slots. With five 26 item containers, the party can potentially store 130 items in addition to those characters have equipped or in their personal packs. Note: right clicking on an equipped item removes it and adds it to the character pack. Left clicking on an item selects it. Once an item is selected, clicking on a destination slot causes the item to be moved there. You can also click on a portrait and the item will be stored in his/her backpack. 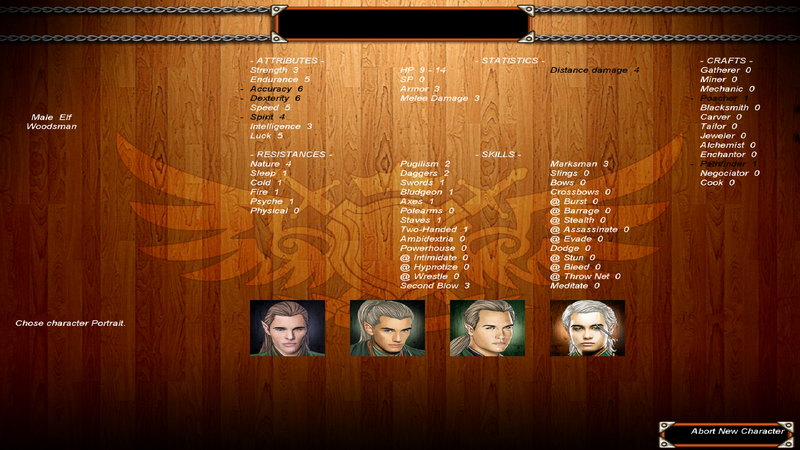 The above is the character’s statistic screen. It is read only and gives a quick overview of the character’s attributes and known skills or crafts. The icons on the bottom left of the status screens allow navigation between these. They respectively give you access to inventory, stats, skills and crafts (where available attribute points can be alloted to learn new skills/crafts or improve known ones), factions (for consultation) and exit. Spells, crafts and magic will be accessible for use via another option in the main GUI. – Sovereign will be much more intuitive and mouse-friendly than Underworld was. Even if the GUI continues to evolve, this will be a priority. – Portraits are in! Right now only the human portraits are finished but it is just a matter of weeks before the others roll in. 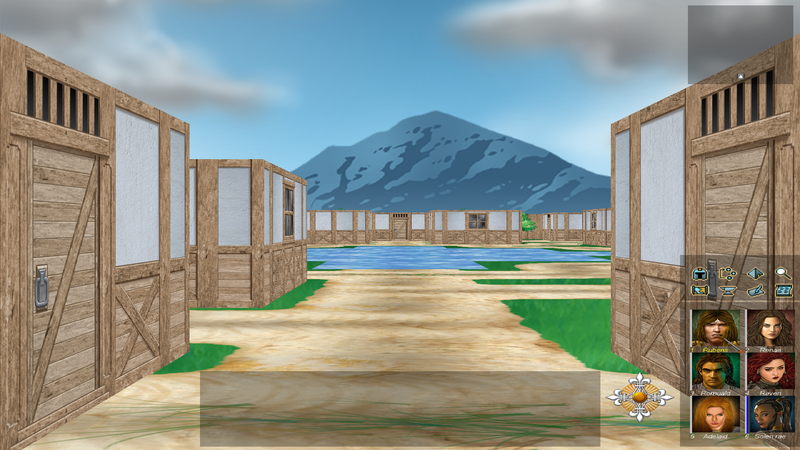 – A new town environment. 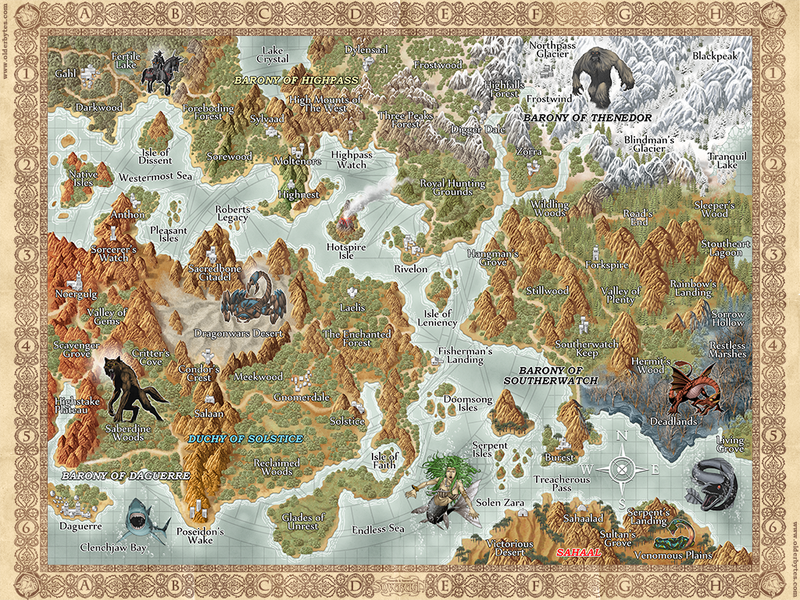 EDIT – In case you missed it, there was a post revealing the world map a few weeks back! Progress is being made on several fronts for the next installment of the Swords and Sorcery series: Sovereign. Namely the world building. And one way to make great progress on that front is to map said world. This is now done! Click on the map for a better view. It is low resolution but still readable and a high resolution image is set aside for the game. Expect more development news very soon, as well as one or two surprises! If you’ve missed them click here to see previous posts.